A one-hour comedy show in voice. The 15-minute film, premiered today, Sunday, July 22nd, 2018, and takes the audience into a moment of time in the lives of two people who come together for one last, shared moment. It reveals how their individual journeys have become intertwined, and the essential role each has come to play for the other. Though the word is never uttered in the film, it essentially addresses aspects of our attitude towards death. 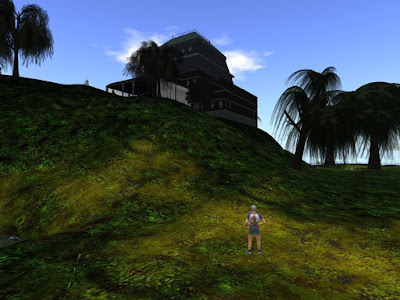 The writing communities of the virtual worlds. What do they offer to writers? Virtual worlds offer a unique opportunity to use the environment and character appearance as supports for ideation in a writers workshop. Here is a third report on a developing plan to do that the Virtual worlds of OpenSimulator. WebWorldz is a virtual world that runs in your browser. Just like a flat web page. But you can move around and talk to people. It offers typed messages and local voice. We will probably start in this place: SandBox: Fantasy region. Jamie and Selby take a virtual field trip to an art gallery in 3DWebWorldz. And we never leave home, even though we are about 350 miles apart. The field trip used only a browser--something everyone has on their computer. And we made a video to show what we saw. Learning in small increments is well known to be the best learning practice. It is hard to accommodate in the old-style school system, but can easily fit into a curriculum making use of internet resources, especially those available in a browser. Web-worlds can provide virtual environments for learning in a browser--accessible on a laptop or tablet. These can offer prepared lesson units approved by subject matter experts. Web-worlds can be delivered on hand held devices and Chromebooks. Classes in school have to be an hour long. Students can only learn by sitting at chair-desks in a classroom. Students can only learn from an instructor talking to them. Students can only learn when an instructor tells them what they are supposed to know. All students learn at the same rate. Students demonstrate learning by showing that they remember what they have been told. For thinking out of the box, read on. The Virtual Worlds MOOC 2018 stats August 1st, 2018. One month of presentations and discussion about the future of education online. Virtual: classrooms, museums, libraries, field trips to anywhere you can imagine: Stonehenge, for example. Later maybe the Moon, Mars, the Emerald City of Oz. Invitation to discuss the promotion of your project in this blog and in video. We can make a video on the spot. If you get a registered account, you can drag and drop jpegs. Virtual worlds offer a unique opportunity to use the environment and character appearance as supports for ideation in a writers workshop. Here I offer a second report on a developing plan to do that the Virtual worlds of OpenSimulator. Building in 3DWebWorldz is easy, once you learn how to find everything. In this tutorial, we start with a brand new region and learn how to add a sky. AI can learn without programmers telling it what to learn.